The Vice President, Prof. Yemi Osinbajo, has tasked the Nigerian Guild of Editors (NGE) to save journalism from its dying state by enforcing the rules and values of the profession. Prof. Yemi noted that most professions, particularly journalism, had been threatened by artificial technologies, adding that social media had virtually taken over the conventional media in terms of readership and followership. Osinbajo, who spoke as the Special Guest of Honour during the 14th All Nigeria Editors’ Conference (ANEC, 2018) in Asaba, Delta State capital, yesterday, noted that it was only the media that can define the true ideology of democracy. The vice president’s goodwill message was titled: “The end of Professions, the end of Journalism.” According to him, the burden is on the guild to set the agenda and the rules as well as enforce and keep them. “For journalism, are we at the end of the profession? Today, social media has totally become the choice of everybody and read by many people than the newspapers,” the vice president said. He noted that apart from the challenges of technology, the professionals remain a challenge to themselves, such that people had lost confidence because most information lacked objectivity and accuracy. He said that the journalism profession had, today, become partisan and were being influenced by politicians and nonprofessionals. He charged the media to fight corruption in the system, adding that corruption, like cancer, could eat up the fabrics and eventually kill the victim, if not checked. While he called for proactive measures to check the activities of quacks in professional bodies, to take professions out of their poor state, he called on the guild to promote credibility, fairness and objectivity as true tenets of journalism practice so as not be presiding over what has stopped from existing. He said: “Is journalism in its dying days? I also belong to a profession that is in jeopardy. But who is to be blamed, if not modernised technology, an inevitable evil? Corruption is a cancer. Once it is committed and overlooked, it will surely kill the profession. The way to take our professions out of their last days is to make the personal sacrifice of removing the bad eggs amongst us and refuse the temptation of corruption.” The host, Governor Ifeanyi Okowa, expressed delight that the conference, tagged, ‘Credible Elections, Sustainable Democracy and the Nigerian Media,’ expressed concern for the future of democracy in the country and tasked the Guild to enact a Code of Conduct to fight the dangers confronting journalism profession. 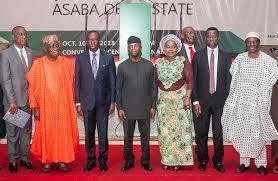 He appealed to the editors not Osinbajo to Editors: Journalism in its dying state lOkowa tasks journalists on credible polls lOver 400 editors converge on Asaba to join desperate politicians to be threat to democracy by helping them to trample upon political stability with impunity. He said: “Democracy should promote the welfare of the people. PDP in 2015 laid the foundation for a sustainable development of democracy in Nigeria when peacefully handing over power to the opposition, APC. Opposition must be allowed to exist. Election should be allowed to be conducted in an atmosphere of trust. “The temptation of suppressing opposition must be discouraged. Okowa stated that the theme was relevant at this point in time, especially in the light of the recently concluded party primaries; insisting that indeed, the choice of the theme aptly reflects the concern of all Nigerians for a free, fair, transparent and credible 2019 elections for sustainable democracy. Earlier, the President of the Guild, Mrs. Funke Egbemode, charged the conference on sustainable democracy through a responsible journalism. She maintained that “a wrong choice next year will leave us with consequences that will last us years.” While she said that the task of choosing a leader was a collective responsibility and a work for a few kingmakers, she maintained that if the media houses and practitioners think “our democracy is on autopilot, they will lose more than their brand new wives.” Egbemode said that 2018 had been an eventful year and one in which the guild had been able to achieve all of its set goals. “This is the year we laid the foundation of editors’ complex in Abuja, but for bureaucratic bottlenecks, our target was to have finished with first floor by September,” she said. She said that the guild was part of the process of reviewing the media code for election coverage in Nigeria.